Ronnie went to work for Grover (Bud) Delp when he was 16 years old. Doing various jobs around the track. Bud sent Ronnie to the Middleburg Training Center for four months to learn to ride. Ronnie had about two years of preparation before he actually started riding between learning his way around the track and learning to ride. On February 4, 1978 Ronnie rode his very first mount – Pioneer Patty to a first place finish at Bowie Race Course. Then his second career win was aboard Deficit. His first big stakes win was aboard Tiger Castle at Pimlico Race Course. Ronnie was a leading winning jockey and even wins the Eclipse Award for top apprentice jockey. Ronnie was allowed to ride Spectacular Bid who was a two year old. Ronnie rode aboard most of Spectacular Bid’s two year old races. Ronnie was still learning his craft as he was riding Spectacular Bid. 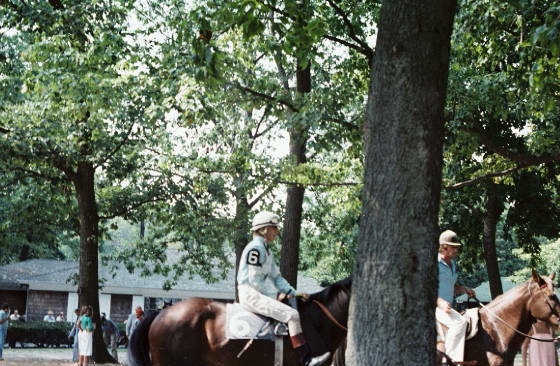 Ronnie was dealing with a lot of stress which was causing problems in his personal life, so to relieve some of the pressure on him, it was decided that Bill Shoemaker would ride Spectacular Bid in all future races. This gave Ronnie time to regroup and took some of the pressure off the young rider. Ronnie rode mounts at Santa Anita in California and picked up tips from Bill Shoemaker, Chris McCarron and Laffit Pincay. Ronnie went back to riding in Maryland, Delaware and Louisiana. Ronnie was able to settle back in and several trainers and columnists noted a maturity in his riding.